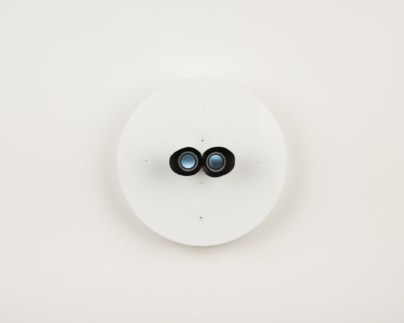 SELF B uses a binocular configuration to draw the viewers interaction. Two camouflaged micro cameras display different abstract fleshy images. The featureless forehead and throat vie for priority inside the eye/brain flip-flop. As in all the SELF ( ) series, there is the sense of being surveilled even though its the viewer themselves doing the observing. (See SELF ( ) series here for a more thorough description of the interplay between the individual SELF components).